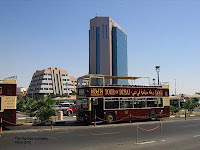 My 2nd day in Dubai – After taking a general overall view of Dubai city via the Big Bus Company I took a trip in the local train and explore Dubai at my leisure. Certainly, this is a better way to enjoy the various tourists’ sights. Amazingly the train system is so efficient and so much help from workers at the stations are around to assist you from the ticket seller, inspectors at the gate/ and at the train platform as well. There are guards, literally guards parading along the platform so I can totally understand why the crime rate in Dubai is really low. Everyone or different races seems to live in harmony together. Train stations are so clean. Food & drinks and smoking are totally not allowed inside the train stations. A fine is imposed if the rules are broken. Even in the streets, outside the station, are very clean. The only litters I notice are butts of cigarettes, not much to be noticeable, but I was looking for any kind of littler. Very impressive indeed - as I can see that Dubai is making a great effort to cater for the tourists, ie showing a great example to encourage tourist trade, since their oil production is running out for export! 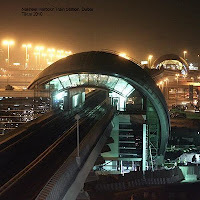 Dubai train system is so much better that of Australian train system. They are even better than Hong Kong and London rail system in the sense that it is so much cleaner and more efficient. Hong Kong & London railways are supposed to be not notch, but Dubai railways systems are catching up. The train arrives every 20 minutes and is on time too. Inside the train, there are not much seats but with lots of standing room. Seats are made of solid materials not of fabric. This kind of seats are much easier to keep clean and cleaner for passengers. We bought a non refundable ticket for AED2 and charged it up to AED4.50 for zone 2 single journeys. The card is activated by swiping the card at the entry/exit turntable. 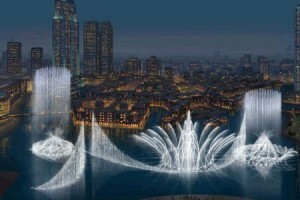 When we are ready to return back to our destination, we just charged up the card again for AED4.50 for a zone 2 ticket. However for the bus, there is another card that works similar to the train. In this sense, the ticket system is not as convenient as the ones in Hong Kong or London. Another tip to note is whenever you go to a big shopping mall anywhere in the world, asked at information counter if they have shuttle bus to go from mall to hotels. 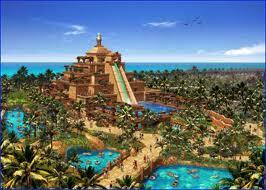 For example in Dubai, they have a free shuttle bus to Atlantis Hotel at the Palms. I had originally intended to go there by using the public bus but with this free shuttle, a bonus…. Dubai Big Bus Company, clean, efficient train, helpful, Middle East, safe, shuttle bus ….